I don’t really have a response for this, so our speedometer-based rapport continues for the remainder of our trip – a quick spot of sightseeing before the start of semester. The sky here is grey and uniform, yet against it, the Isle looks more alive: brown-green and purple. Despite Skye itself being small enough to drive north to south in its entirety in around two hours, every kilometre of the northern peninsula seems to hold something new in its own right. Each basaltic obelisk looks to have its own character, each volcanic outcropping its own story; even each hill we pass by seems to have its own demeanour. I whip by each landmark in a frenetic sort of awe. Speed offers a much more entertaining way to experience a place like Skye than the tortoise-method. There’s an ironic pleasure in making fleet of a countryside that, down to the last cobblestone ruin, sedge-choked fence line and mist-weary seaside village, appears at every inch to be the most rooted and ancient in the world. I ignore or skim most placards and information posts, hike quickly (running, where my woeful stamina and the uneven trails allow it), and spend no more than short whiles at each hotspot: Skye is best experienced in moments. 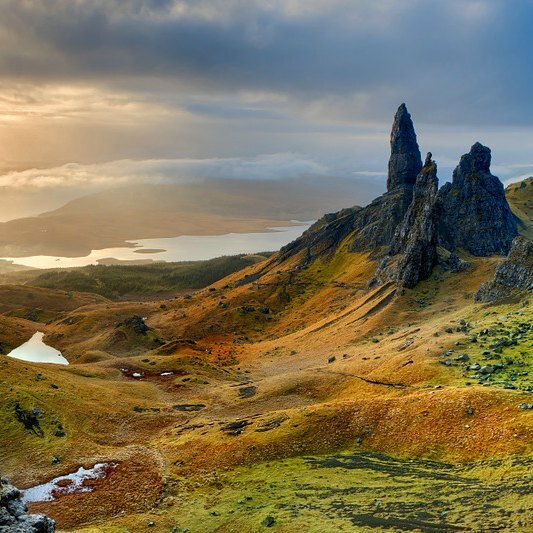 That isn’t to say we never slow down for the ceaseless panoramas Skye has to offer, but as eighty kilometres are to be travelled in a single day, speed is a necessity. We park at all the hits: starting from the Isle’s largest town, Portree, we make our way northwest to Fairy Glen, then turn off the A87 onto a weather-worn path, cutting eastward through the peninsula’s midsection. After this, we pass through four more spots dotting the eastern coast: Kilt Rock and Mealt Falls; Rubha nam Brathairean, a tucked-away bowl of pastoral wonderland; and Lealt Falls. We continue southward to the Bodach an Stoir, a stoic and corrugated rock jutting from near the mountaintops, shrouded in a heavy mist, it was the most satisfyingly Scottish-looking location on our trip. We then zip through Portree once more for lunch before jabbing west, for Dunvegan Castle, and back. We keep visits to these places brief – the beauty of the Trotternish Loop is that it can be done, if need be, in a short space of time. We get out of the car for our second main stop. We’ve reached one of the world’s precipices: walking forward, the patchy, damp grass drops away, and there’s the Quiraing, the widest and most sweeping view of which I am aware on this earth. Foothills roll on for miles, ineffectually lassoed by narrow strings of road, before breaking to the sea and its haze. Rock formations litter the mountains to our left, dolomitic wardens keeping vigil on high. Open and expansive, ridges ripple and dwarf the farms peppering their sides. Through the cold, we stay a while. Take it all in. I’m a man of moments, but some things require more than one to absorb properly. The Quiraing is one, of a few, on Skye, and one that must be seen: no words and no picture can do the immensity of its presence justice. Images courtesy of cdn.earthporm.com, www.highlandexplorertours.com, erlinatour.com. This entry was posted in The Wanderer and tagged A87, local travel, Reflections on, roadtrip, Scotland, sightseeing, Skye, The Trotternish Loop, Travel. Bookmark the permalink.